Schedules in the Biphasic family of sleep schedules are characteristic in consisting of only two sleep blocks. 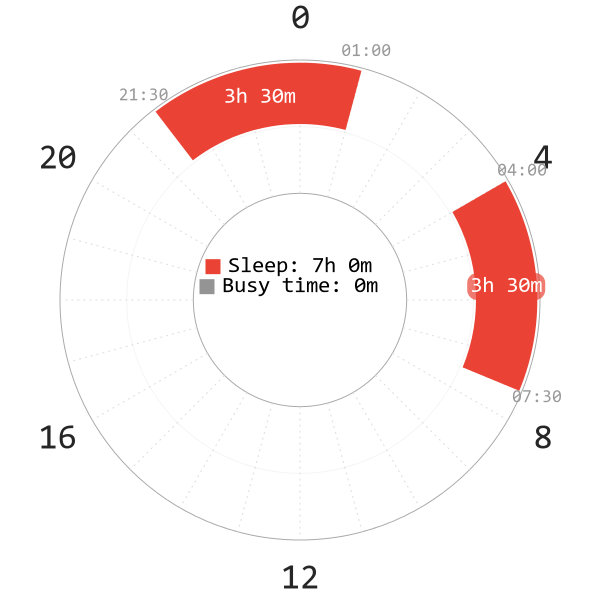 The main biphasic sleep schedules are Segmented and Siesta. They have been used as the main sleep schedules for a long time throughout human history, and continue to work very well in the modern world. Sleeping in a biphasic style could be considered to be more natural than sleeping monophasically, because the bodily rhythms naturally tend to lean towards biphasic sleep when artificial light is removed1. Segmented sleep was common throughout the year in preindustrial Europe. Even in “Siesta” cultures seasonal changes to napping patterns were only minimal. It is however clear that biphasic sleep was not unique to Western people. People often slept in two segments all over the world2. Sleeping in a Segmented pattern even happens naturally in today’s world, where current agricultural societies without electricity tend to sleep in two segments, as well as possibly take naps3. There are two main principles which the biphasic schedules likely utilize. The sleep blocks during the biphasic sleep which commonly occured before the advent of artificial lighting. These blocks coincide with the peaks of SWS and REM activity which are approximately 9 hours apart4 which the monophasic sleep does not cover. Schedules like the Siesta practiced by a number of people in Spain place the sleep blocks at the times of the circadian day when the energy levels are lowest4, namely the night and the circadian nadir in the afternoon. 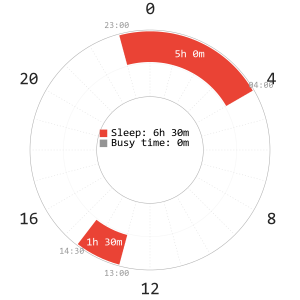 While the biphasic sleep schedules do not allow for a large reduction of sleep time, the quality of properly scheduled biphasic sleep is often noticeably higher than on monophasic sleep. Because of this, biphasic sleep is often recommended for people who cannot significantly reduce their sleep time (e.g. being underage or having heavy SWS requirements). People with no prior experience with polyphasic sleep are also recommended to start out with easier schedules, as the adaptation process is much easier than with more advanced polyphasic sleeping schedules. Less sleep reduction also means that there will be more room for error, so it is a good way to practice polyphasic skills and learn what activities are harmful for adaptation. Segmented sleeping is a traditional form of sleeping which was common in pre-industrial society before the introduction of artificial lighting2. It consists of two cores of equal length with a waking block in-between. Segmented sleep mechanics are based on the peaks for SWS and REM being roughly 9h apart. An 8h long monophasic sleep block cannot cover both peaks. With a segmented sleeping style, the first core is closer to the peak SWS time and the second core is closer to the peak REM time. Focusing the cores to the specific sleep types in this fashion will yield a higher sleep quality, which then allows for some reduction in total sleep time. Usually each sleep block will be 3.5h long and the waking period between them should be at least 2 hours. However, some people have quit segmented with a 2h gap from being unable to adapt or feeling too unproductive. The core gap also serves to prevent the cores from being treated as interrupted sleep. A 2.5h, preferably 3h gap minimum is recommended for these reasons. Each core consists of 2 full sleep cycles plus an extra 30 minutes of sleep time to cover the statistically likely REM period. The statistically likely REM period originates from Polyphasic society, and the evidence for it is very poor (eight monophasic readings). While it’s existence is questionable, it is still possible to see the effects from having the cores be 3.5 hours long. Another explanation for the 30m extension on each core is from the possibility that the cycles extend to roughly 105m as compared to the standard 90m cycles in monophasic sleep. This would explain the viability of the schedule despite having less cycles. For ideal scheduling, the first core should be placed to start around 9-10pm and the second core at around 3.30-4.30AM at the earliest, but large core gaps are also possible. Segmented sleep can total 7 hours each day, but that’s not the only possible option. It can instead also be scheduled to have 2 cores of 3 hours each, but in this case a longer gap between cores is needed to keep the sleep block aligned with the REM and SWS peaks. It is also not guaranteed that everyone will be able to adapt to such a schedule. The siesta sleep pattern is another traditional form of sleeping. It consists of two cores; one long core during the night and a single-cycle core in the afternoon. Siestas are widely practiced throughout the world and are typically associated with Spanish culture. According to a poll conducted on the Reddit community, Siesta is the schedule with the highest successful adaptation chance. The logic behind this schedule is based on the fact that the circadian rhythm has a low point during the early afternoon, usually around 1pm-3pm. Because of this, most people in western cultures find the early afternoon to be the least productive time of the day and often take coffee breaks or eat to allow them to keep going until work is over. Placing a block of sleep here allows for better use of this natural period of tiredness experienced by the body. The core at night can then be significantly shortened without compromising sleep quality. The night core will be around 5h long, allowing for 3 full sleep cycles plus an extra 30 minutes of sleep time to cover the statistically likely REM period (more REM appears in the morning, so REM cycle becomes longer). The afternoon core is one complete cycle (90m). As with Segmented, the core extension compensates for the fact that the schedule only contains 4 cycles instead of 5. 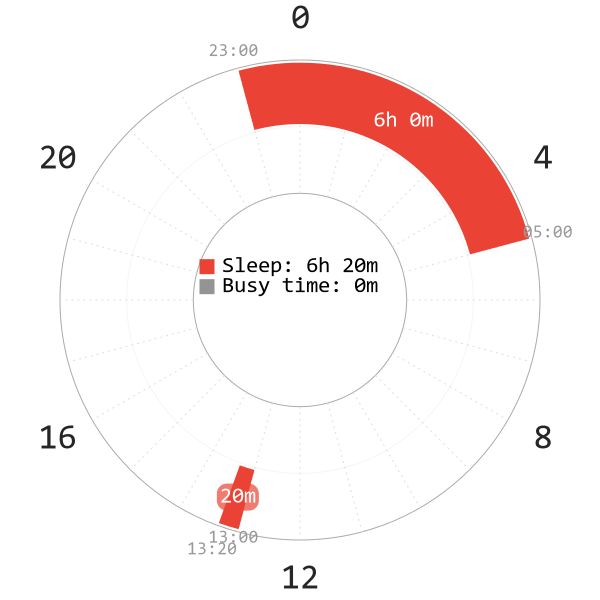 Everyman 1, or just E1 for brevity, is a cross between the Siesta and Everyman sleep patterns, and is the easiest schedule which contains a 20-minute nap. A long 4-cycle (6 hours) core at night is complimented by a 20-minute nap in order to give 5 cycles of equivalent rest. This schedule is a popular one for polyphasic beginners because it is an easy schedule to get used to, while providing an introduction to 20 minute naps at the same time. This helps to provide experience with napping in a relatively safe setting with a low adaptation difficulty. After successfully adapting to Everyman 1, the basic groundwork is in place and it is easier to move up to more difficult schedules. For ideal scheduling, the core should be placed to start around 11pm and the nap placed at around 1pm. However, possible albeit non-ideal variants include the main sleep at night, but the nap is much later in the day, for example 4 PM or 5 PM . These variants often suit 9-5 people, who cannot nap at noon and can only achieve to nap after work (around 4-5 PM) and students with similar daily schedules. These variants can be risky during adaptation because: 1. The late nap in the day can make falling asleep at night harder, and 2. Afternoon/borderline dusk times are usually better suited for a core sleep of at least 90m, rather than a short nap of 20m as REM is less likely to occur during the SWS-heavy evening period. Despite all their shortcomings, these E1 variants are still doable with some effort because of the wakefulness sustaining provided by the nap and the lengthy core.